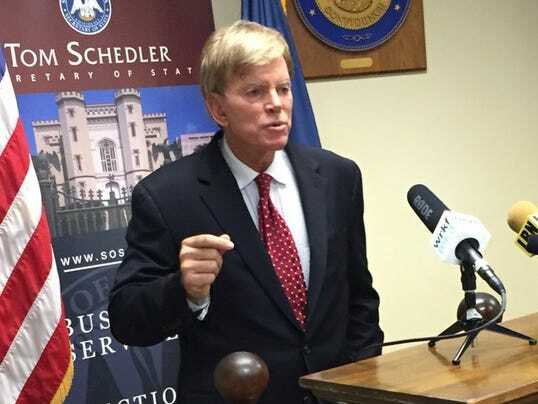 BATON ROUGE â Former Ku Klux Klan wizard David Duke emerged from a 17-year political hiatus Friday to officially sign up to run for U.S. Senate in Louisiana, a state already roiling with racial tension. Duke, a Republican who served one term in the Louisiana House, hasn’t run for office since 1999. He is running to fill the seat that will be vacated by RepublicanÂ Sen. David Vitter. Duke’s announcement comesÂ after the shooting death of a black man by white police officers and the killing of three law enforcement officers by a black man. It also came one day after Donald Trump accepted the GOP nomination for president. “Black Lives Matter has gone around the country and advocated for the murder of police officers,” he said after signing papers at the Louisiana Secretary of State’s office. Duke also said media have incited violence against police. He said the murder of three Baton Rouge policemen triggered his entry into the race. Duke said he was inspired by Trump’s acceptance speech Thursday, noting Trump discussed immigration and equal rights, among other issues. “I thought, wow, here’s a man embracing the core issues I’ve fought for my whole life,” he said. Duke regained some notoriety during the presidentialÂ primary cycle when he endorsed Trump. The Republican nominee was criticized for initially refusing to disavow Duke’s support, saying he didn’t know anything about Duke, before finally distancing himself from Duke days later. “I don’t care about what Donald Trump says about me; I respect what he’s doing,” Duke said. The Louisiana Secretary of State’s office said Duke, who was convicted of tax evasion in 2002, had his voter registration restored in May. He hasn’t voted since 2000. Previous felony convictions don’t prohibit serving in elected office. Duke is perhaps America’s best-known white supremacist. He was elected to Louisiana’s House of Representatives in 1989 and served one term. Roger Villere, chairman of the Republican Party of Louisiana, quickly condemned Duke. âThe Republican Party opposes, in the strongest possible terms, David Dukeâs candidacy for any public office,” Villere said in a statement. 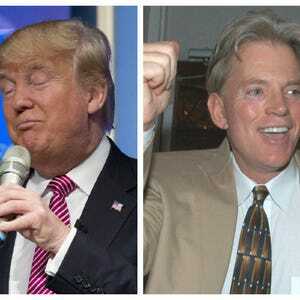 “David Duke is a convicted felon and a hate-filled fraud who does not embody the values of the Republican Party. National Republicans also distanced themselves from Duke. Public Service Commissioner Foster Campbell, a DemocratÂ who’s in the race, said Duke’s rhetoric has “the potential to rip our state and country apart. I vow to stand up to anyone seeking to divide rather than to unite our people,” he said. Duke was a perennial candidate in the 1970s, ’80s and ’90s with just one victory. But he was a factor in other races, especially in the 1990s, most notably making the runoff for governor in 1991 before losing to former governorÂ Edwin Edwards. In his last race for Congress in 1999, Duke finished third and out of the runoff in an election eventually won by Vitter. Duke’s announcement overshadowed the entrance of retired Col. Rob Maness into the fray Friday. Maness, of Madisonville, La., made a fiery entrance, blaming Congress and President Obama for the terrorist attacks that killed 49 in Orlando and 14 in San Bernardino, Calif.
“They’re responsible for everything going on in this war,” said Maness, who had a 32-year career in the U.S. Air Force. Duke’s and Maness’ entry into the race grew the field of candidates to 23, the most on record in the Secretary of State’s office. The seat is open because Vitter decided not to run for re-election.